The beatification of Franciscan who translated the Bible into Chinese took place before the Cathedral of Acireale, and not inside, because of the large number of faithful. Card. Joseph Zen and a delegation of Hong Kong present. The relic of Fr. Allegra brought by the doctor who was miraculously healed by him. The director of the museum in Taipei converted to Catholicism through the faith of the new Blessed. Acireale (AsiaNews) - A humble man, ready to wash the floors in place of any seminarian, a holy man, who spent his free time in silence before the tabernacle, a man of strong faith that sustained him in his " titanic work " of translating the Bible into Chinese: this is how Card. Angelo Amato, prefect of the Congregation for the Causes of Saints, described the figure of Fr. 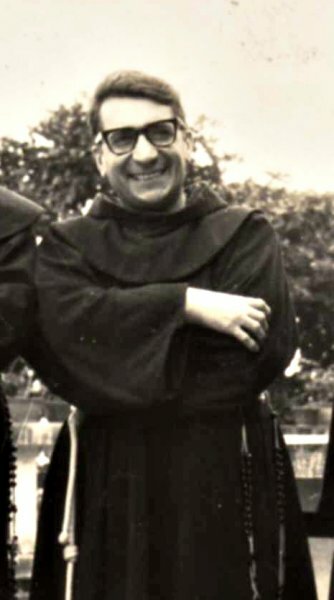 Gabriele Maria Allegra, who was beatified on September 29 in Acireale (Catania), in the diocese where he took the first steps of his Franciscan vocation. The ceremony was attended by thousands of faithful. At first it was planned inside the cathedral, but then was moved to the square in front of the building, due to the unexpected large number of participants. There was also a group from Hong Kong, led by Card. Joseph Zen, bishop emeritus of the city where Fr. Allegra lived. After reading the announcement of the beatification, signed by Benedict XVI, a reliquary containing a relic of the new Blessed was unveiled near the altar, brought by doctor who was cured of terminal cancer through his intercession. The Gospel of the Mass was proclaimed in Italian and Chinese, by Card. Zen. In his homily, after describing the childhood of the blessed, Card. Amato said that "it was in 1928, on the occasion of the seventh anniversary of the death of Blessed John of Montecorvino (1328-1928), first archbishop of Kambalek (Beijing), when the irresistible vocation to go as a missionary to China first exploded within him. The speech given by Father Cyprian Silvestri was a burning fuse, against the powder keg of his heart. It was then that the young student of theology first thought of the idea of ​​translating the Bible into Chinese. Given that there was no Catholic version of Holy Scripture in the that language, he proposed to go to China to realize this dream. And so it was. He began this effort alone in Heng Yang on April 11, 1935, he then went to Beijing and concluded in Hong Kong in 1961. This was the great literary enterprise of the Chinese Catholic Church, praised by Catholics and non-Catholics. " The cardinal also stressed Fr. Allegra 's "Eucharistic soul", which led him to spend time in prayer before the Blessed Sacrament. "The director of the Historical Museum of Taipei - he added - confessed one day that he had converted to Catholicism, by watching Father Gabriel, who celebrated the Mass". There are also many stories about his profound humility, his praise of his collaborators and the way he would parry praise for the translation of the Bible into Chinese. Citing a Franciscan brother, the Cardinal said: "Despite all his hard work over many years in the translation of the Bible I do not think his name ever appears, be it in the original" Fr. Gabriele M. Allegra ", or Chinese:" Lei Yung-ming", everything is signed:" Scotus Bible Study. "In his presentations and reviews he always wanted to highlight the merits of the fathers co-workers, and would be incensed when he read references to himself". Fr. Allegra not only founded the Franciscan Biblical Institute. In a prophetic way he also founded "a Sociological Study centre to spread her social doctrine of the Church. He was a dynamic apostle of the Gospel, as a preacher, confessor, spiritual director, and writer." "For Father Allegra - said Cardinal Amato - reading the word of God was immediate and kindled in his heart a sacred fire which burnt the interpretations of convenience and fatigue of superficial glosses, rather which illuminated the radical nature of loyalty and of heroic witness .. In Blessed Gabriele Allegra, we can rediscover the joy of picking up the Gospels, to find our code of life and our identity as baptized people, salt of the earth and light of the world, capable of heroism and of holiness. "